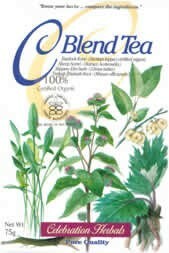 C Blend is a blend of 4 herbs that act synergistically to promote detoxification and support general health. C Blend was our very first product, and we still hold it dear. It is made up of all organic herbs, and we keep the price as low as we can so people can afford this tea when they can't afford any other treatments. 3x 2 part herb packets (so herbs and roots can be brewed separately). 2 cotton drawstring bags. Detailed instructions. Each box makes three batches for a total of 3-4 liters of tea, which is about a months supply. With origins in Native American medicine, this blend was brought together with modern medicine in the last century. Rene Caisse is credited as being the practitioner responsible for popularizing this wonderful blend. Today, this same blend is marketed under hundreds of brand names and is a staple in the herbalist's arsenal of blends. Your local health food store is an excellent source of information about this invaluable blend. Visit today and ask about the well known "Caisse Tea." If you find our brand, named C Blend Tea, you will be getting an all-organic product, at significant savings over what most manufacturers would charge. Now also offered in tea bags for on-the-run use. Note that teabag form is NOT as potent as this brew kit and is not intened for theraputic use.